Went in for a couple of jars today after a nose around the market. Great pub with very well appointed interior. Only had the guiness as am not a fan of fuller ales, but was nice enough. Worth a visit if in the area. Just came back from meeting my husband for lunch. Ordered a sausage sandwich and cheese and biscuits. The waiter, after about 15 minutes informed me that they had no biscuits - just french bread. After another 15 minutes I went and asked the girl (manager?) behind the bar how long our food might be as I only had an hour for lunch! She told me she had just rung them. No apology. Another 5 minutes and lunch turned up - minus any cutlery for my husband, minus chutney which is supposed to come with cheese and biscuits. Tomato Sauce and Mayo were brought to the table - new tomato sauce wouldn't come out of bottle and mayo still had seal on the jar. I suppose that did at least show it was Heinz! Not a good visit - have been here for lunch on quite a few occasions over the past 5 years and it's pot luck what sort of service you get - won't be going back. Decent range of quality beers, the pub is on two levels which is common with many Fullers pubs near The City.Most times I've visited its tended to have its fair share of the suited. The photo here is quite deceptive as it makes this pub look like it has quite a narrow facade. 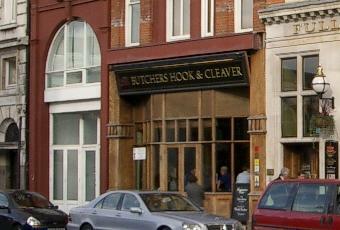 In truth the front of the pub is at leat three times as wide as the signed bit shown. On entering it's a large high ceilinged room with a mezzanine area to the right of the bar and a seating area under this that is cosier than the main bar. As a Fullers pub it has a full range of their beers on offer - Pride, ESB, Discovery, Chiswick and Jack Frost on pump with London Porter and Honeydew on tap. I generally like Fullers pubs although their offerings in the City are mixed - the Swan in Leadenhall is excellent while the Fleetwood and Telegraph are rather average. This pub despite appearing rather new is towards the upper end of the scale and if you're tired of the 1940s surroundings of the Hand and Shears a 5 minute walk here will be worthwhile. A good selection of beers in reasonable condition served by fast and polite staff. The food was all fine but the chips that came with the burger were possibly the best that I have ever had. And I have had a lot.